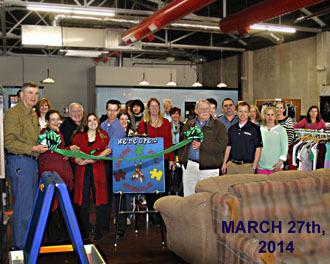 Ribbon cutting ceremony held for Going Full Circle on March 27, 2014. Going Full Circle is a 501(c)(3) public charity. Moreover, GFC is a fully functioning thrift store with training facilities for adults with autism. Most importantly, all vocational training will be conducted by Nicole Poitras, CEO of Going Full Circle. Nicole has a Master’s Degree from the University of South Florida in Autism and Low Incidence Disabilities. She teaches students with autism and has been working with individuals with special needs for thirteen years. In addition, Nicole was awarded the Autism Teacher of the Year Award by the North Carolina Autism Society in 2010.